McDonald’s ongoing effort to simultaneously appear to offer healthier food and attract hungry customers has resulted in a tentative partnership with yogurt maker Chobani. The AP reports that around 800 McDonald’s locations in California will be testing parfaits and smoothies made using the popular Greek-style yogurt. A spokesperson for the fast food giant confirmed the tests, but said it was “very premature to determine if it may expand,” beyond the California region. Restaruants taking part in the tests have started offering a “Simple Delights Menu” that consists of the Chobani-made smoothies, yogurt parfaits, and other healthy food options like apple slices. The AP reports that in addition to the Greek yogurt based items, some Southern California restaurants have also started testing two breakfast bowls during the morning hours. One bowl is made with egg whites, turkey sausage, spinach, and kale, while the other contains scrambled eggs, and chorizo and includes a hash brown. 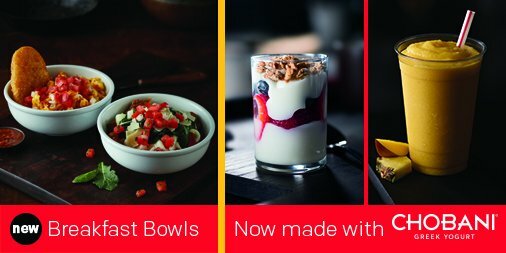 The McDonald’s spokesperson says the breakfast bowls were tested on a more limited basis last year before expanding to additional locations this year.